Software license of SAS is renewed and the new software license (with expiration date: 30-Dec-2018) is now available. The existing SAS software license has completed the grace period and license was expired on 29-Jan-2018. If your office computer is installed with SAS 9.3 and SAS 9.4, please contact ICTO Help Desk for updating the license. 2) Click the “Submit” icon to run the statements. 3) After running the statements, the product license information will be shown on your SAS log window. 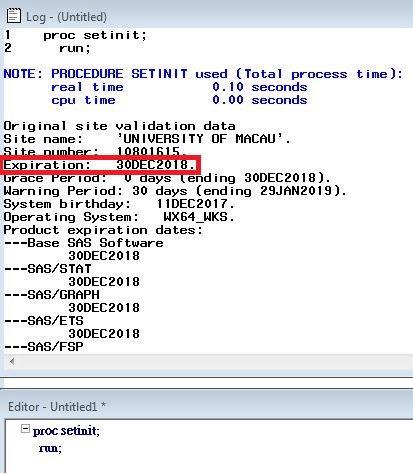 Under the blue NOTES in the same window, you will see the expiration date of your SAS license (as shown in the figure below).